Declutter – Remove as much as possible from the boat. A boat that is open and can be inspected in all areas is more likely to have a positive impact on a prospect. Your boat will be very memorable when compared to others that are a mess and difficult to easily inspect. If taking all of your gear off the boat is difficult or not practical, find one spot on the boat to put everything. The best is one spot that can be sectioned off from the main cabin – V-Berth, aft cabin or cockpit locker. Clean – A surface cleaning is easy and must be done. Additionally, these other spots have a huge impact: Bilge – Really get in there and get it dry and clean. Engine Sump – Clean, degrease, dry and put in new drip pads. III. Odor – Your boat should not smell! Do not make the mistake and cover the smell with car fresheners or pot-pouri. Get to the source and replace hoses. Black and Gray water hoses do not last forever. Waste and organisms permeate the hose and cause the smell. This is the most expensive and effort detail on this list but it must be done. Smelly boats do not sell. Stage – Many people remove fabrics, cushions and mattresses in the off-season. When your boat is for sale, you should keep them aboard. The first impression of the buyers is very important. The cushions and fabrics installed give it a warm, comfortable and livability feel that give the buyer a better idea of what it will be like to be onboard in season. Remember these buyers are looking at your boat in the off-season and it is probably cold and gray out. 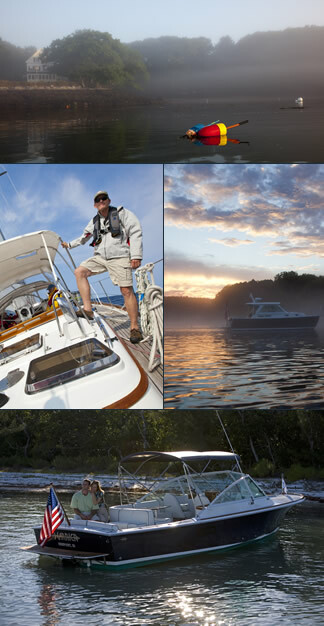 A comfortable, clean, uncluttered boat gets them feeling good about the boating season ahead. Deck – Thoroughly clean the deck and lockers, organize gear and dry out the space before covering for the winter. Make sure the deck, cockpit scuppers, corners and crevices are clear of leaves and debris before the yard applies shrinkwrap. Be in touch with the yard in advance so your notified before the cover is on. Exterior Wood Work – Exterior varnish is huge effort and expense. If your teak needs some attention you should as a minimum strip or sand down to bear wood. It will allow the next owner to decide if they want varnish, oil or just let it go gray. VII. Hull – Make sure all the growth is off the hull and that the waterline and prop/shaft is clear of stains and debris. Go one step further by waxing your topsides, apply bottom paint and install fresh zincs in the fall, making the boat look ready to go in early spring! VIII. Placement in Yard – Speak with your service or yard manager and request they locate the boat in a spot that is available for wintertime surveys and sea trials. Some yards even have a set aside location for boats for sale. The last place you want to be is buried by other boats and not available for an early spring launch. If you follow these simple, low effort suggestions, you will increase your chances of a great showing, a possible offer and sale!